It will be a night to remember in Country Music. From start to finish, it was a spectacular TV show, one of the best in CCMA History. Fans were glued to their seats watching all their favourite artists receiving their awards and seeing the artists perform their outstanding performances. 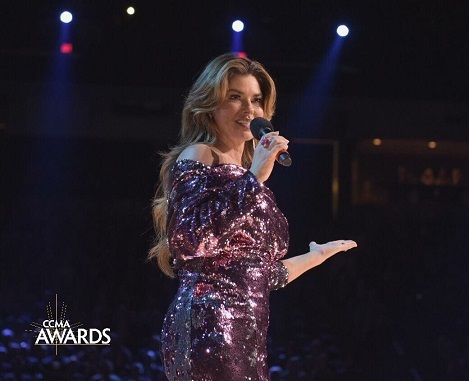 It was a night to behold, seeing Canadian Legend Shania Twain host the show as well receiving 4 CCMA 2018 Awards. The evening host, Shaina Twain was awarded Top Selling Album of the Year-Top Selling Canadian Album of the Year-The CCMA Generation Award- and the coveted Apple Music Fan's Choice Award voted by the Fans. A Shania Twain tribute performed by Ford Album of the year winner Jess Moskaluke, Kira Isabella and Madeline Merlo. They were surrounded by a crowd of 10,000 country music fans and the 2018 CCMA Award stage came to life as internet-sensation MASON RAMSEY made his first Canadian Award Show appearance and international superstar Keith Urban performed his hit, Never Coming Down. Highlights also included collaboration performances by 2018 CCMA 2018 CCMA Award winner BRETT KISSEL and SERENA RYDER, a tribute performance for 2018 Hall of Fame inductee TERRI CLARK by Suzy Bogus, Jessica Mitchell, Meghan Patrick and Clark herself.